That powdered cocoa mix in your pantry? Leave it for the kiddos. It’s time for some decadence. It’s time for some richness. It’s time for grown-up hot chocolate. This stuff isn’t a big, huge, steaming mug of mildly flavored chocolate milk. And it’s not low-calorie. This is rich, thick, intensely-chocolatey, oh-I-wish-I-could-lick-the-coffee-cup hot chocolate. You don’t need much – this is why the serving size is on the small side. But let me tell you, this is the after-dinner treat you must make this winter. It’s that good. 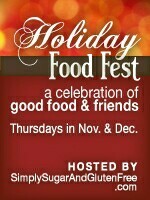 The theme for this week’s Holiday Food Fest is Holiday Cocktails, Mocktails and Appetizers, hosted by Amy at Simply Sugar and Gluten-Free. I am not much of a cocktail person (I prefer the occasional glass or two of merlot or cabernet, a gluten-free beer, or if I’m feeling “fancy”, a glass of cognac), so my experience in the cocktail-making arena is rather limited. I know margaritas and mojitos, but that’s about it. (Since the temperatures are hovering around the freezing mark right now, neither of those drinks sound remotely appetizing!) I needed to venture outside of my comfort zone a bit. And then I thought – hot chocolate. Who doesn’t like hot chocolate? I had a bar of Valrhona in the fridge just begging to be used. Suddenly, I knew an over-the-top hot chocolate was just the thing. But even I underestimated the silky, creamy, lushness of this treat. I opted to dip a spoon into mine, rather than sipping directly from the cup, just so I could savor every minute drop. I can envision this being the perfect treat to enjoy on Christmas Eve, relaxing, after the stockings are stuffed and all is quiet in the house. In a saucepan over low heat, bring chocolate, milk, and cream to a simmer, whisking constantly. Simmer 1 minute or until slightly thickened. Remove from heat; whisk in liqueur and vanilla. Pour into four small tea or coffee cups. Top each serving with whipped cream.